New insights into life in the ancient oceans are emerging from a huge fossil found in a remote reach of northern Alaska — the largest and most complete specimen of an ichthyosaur yet found in the region. 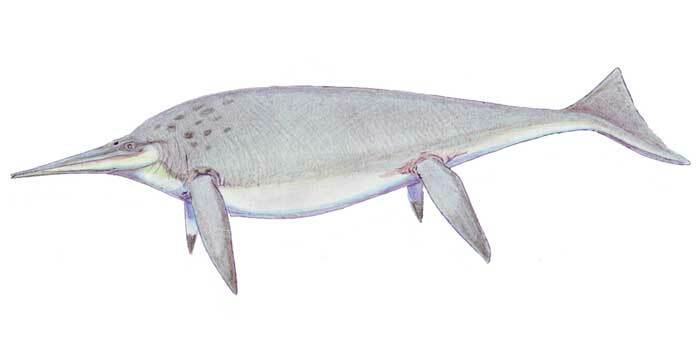 Ichthyosaurs in some ways resembled modern porpoises and whales, having to surface to breathe and giving birth to live young. But they bear no relation to today’s aquatic mammals; instead, they were marine reptiles, and the largest of them — including the group that the Alaska specimen belonged to — were some of the biggest animals that ever swam. “Ichthyosaurs were amazing animals,” said Dr. Pat Druckenmiller, earth sciences curator at the University of Alaska’s Museum of the North, in a press statement. 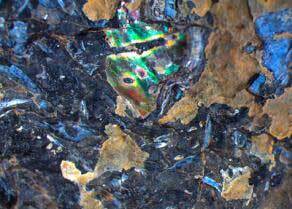 The fossil dates back some 210 million years, when most of the planet’s land was locked in two supercontinents, and the rest — including what’s now Alaska — was covered with water. “This particular animal died during the Triassic Period and settled to the floor of the sea that used to occupy the place where Alaska is now located,” Druckenmiller explained. Ichthyosaurs ruled these ancient seas as a diverse group of marine predators, as evidenced by even more fossils of found inside the Alaskan specimen. Its innards were found to contain fragments of fish bone and the shells of ammonites — the undigested remains of its final prey. “We found the last meals that this animal ate,” Druckenmiller said. 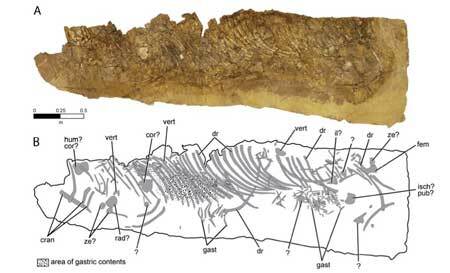 “Finding gut contents in an ichthyosaur of this age is very rare and provides valuable insights into the diet and ecology of Triassic ichthyosaurs. The fossil was first identified in 1950 by geologists surveying what’s now the National Petroleum Reserve-Alaska. “We knew what it was when we found it,” said Carl Benson, one of the scientists who was on the expedition, in a statement. But the animal measured some 10 meters in life, and the best-preserved portion of its fossil was nearly half that size, far too large to pack out of the wilderness. It wasn’t until 2002 that the remains had been excavated and could be airlifted by U.S. Army helicopter to Fairbanks. Druckenmiller and his colleagues report the find in the Journal of Vertebrate Paleontology. It’s almost hard to believe that anything could survive 200+ million years and still be so in tact. Fascinating.